Your profits depend on getting the most productivity from every dollar you spend. You hire people to perform multiple tasks – why shouldn’t your equipment do the same? 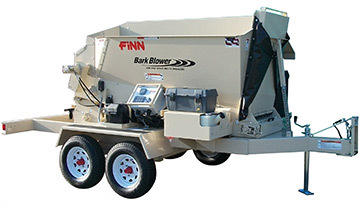 FINN Bark & Mulch Blowers are the most versatile performers you can find, delivering high quality results in landscaping, erosion control, and construction related applications. With high production bulk material handling and accurate application, your workers can increase productivity up to 700%. And since FINN Bark & Mulch Blowers apply uniform coverage, you’ll achieve material savings of 25% or more. It is the most versatile worker on the job site – delivering needed materials to hillsides, tough terrain, and all hard-to-reach areas. Our exclusive Rotary Airlock conveys a wide variety of bulk materials and particle sizes. Control feed and discharge rates while spreading, with control panel or radio control. Control dust with the adjustable rate liquid injection system. High volume, efficient air pump carries material smoothly through hose lengths of 300’ or more. At the flip of a switch, the tarp retracts for loading, and extends for covered transport. The optional seed injection system allows for easy blending of seed into compost and soil blends.